I had some buttermilk left over from another project. 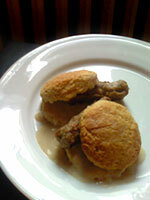 As far as I’m concerned there are two preferred uses for buttermilk: fried chicken or biscuits. I love biscuits. They are super easy and a crowd favorite. In a large bowl, with a fork, mix the flour, powdered milk, sugar, baking powder, salt, pepper and cream of tartar till the pepper looks evenly distributed. Add the shortening and mash it into flour mixture. Keep mixing in the shortening until the flour gets an even course meal texture and it all looks slightly yellow. Preheat the over to 450 degrease. Stir in half of the melted butter and then the buttermilk. Switch to mixing with your hands. The mixture will be sticky. Let it sit for 5 minutes. Then turn onto a floured surface and need the dough till smooth. Roll out the dough to a ½ inch thickness and cut into biscuits with a glass or round cookie cutter. Place the biscuits onto a silpat lined baking sheet. Bake for about 15-20 minutes until the biscuits are golden brown. Brush with the remaining melted butter. Cook the sausage in a large skillet. Make sure you brown each side of the link. Remove the sausage to a plate. Add the milk to the same pan, deglazing the pan. Season the milk with salt, pepper, garlic powder and sage. Cook the mixture until boiling. Mix the flour with the remaining milk and whisk it into the hot milk mixture. Keep stirring to thicken. Season with more salt and pepper to taste.